The quiet operation of the keys of your piano depends upon three sets of felts (front rail punchings, balance rail punchings and back rail cloth) that function as cushions. Besides their ability to absorb unwanted sounds, these felts are also important in determining both the height of the keys and the depth of the keystroke. As the piano is played over the years, however, these felts become thinner and harder. The keybed felts of your piano have worn to the point where removal and replacement would benefit both the touch and appearance of your piano. 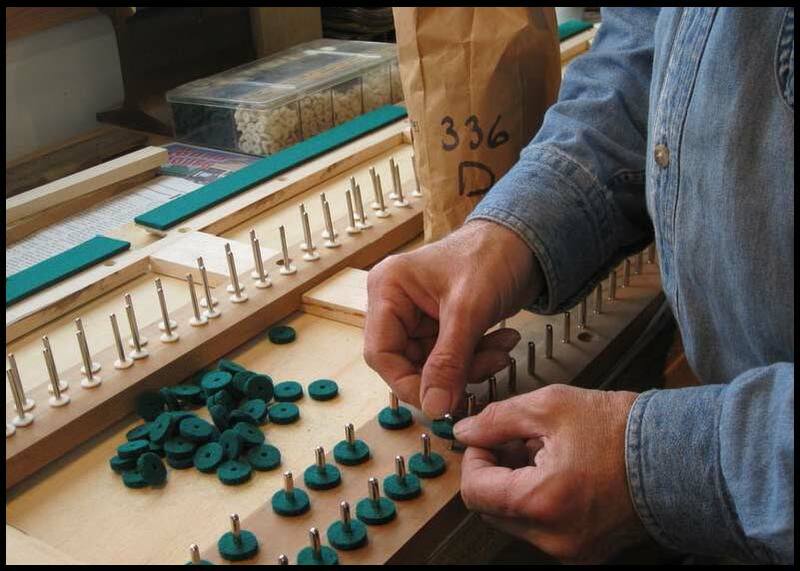 The following commonly asked questions have been answered to give you the information you need in order to decide whether or not to have the keybed of your piano refelted. 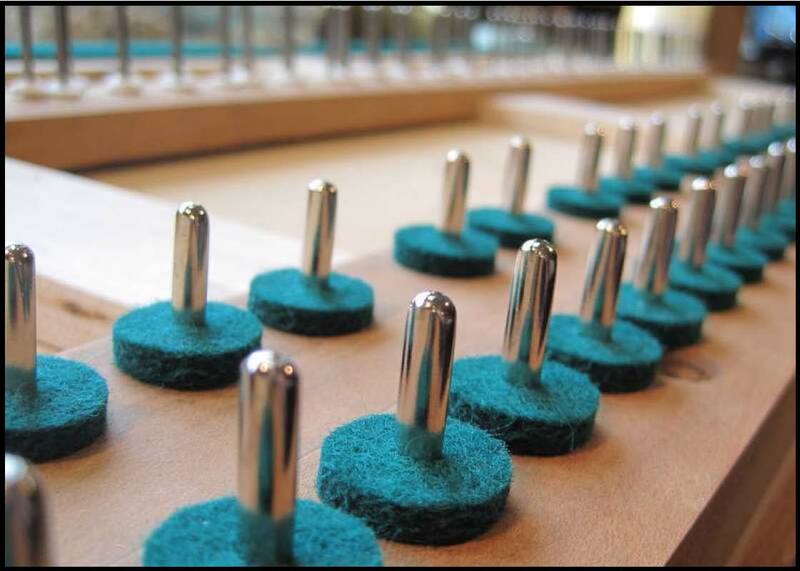 What are the most noticeable effects upon the performance and appearance of the piano that are caused by worn keybed felts? As the keybed felts harden and wear thin the keys become uneven in height from note to note. Also the amount of downward stroke (key dip) begins to vary. This variation results in an action which has an uneven touch. A perfectly level set of keys with a uniform amount of key dip is essential to a piano action which is performing up to its potential. In addition to the negative impact upon the touch of the piano, uneven keys that result from worn felts give the keyboard of the piano an unattractive and uncaredfor look, making the piano less inviting to play. 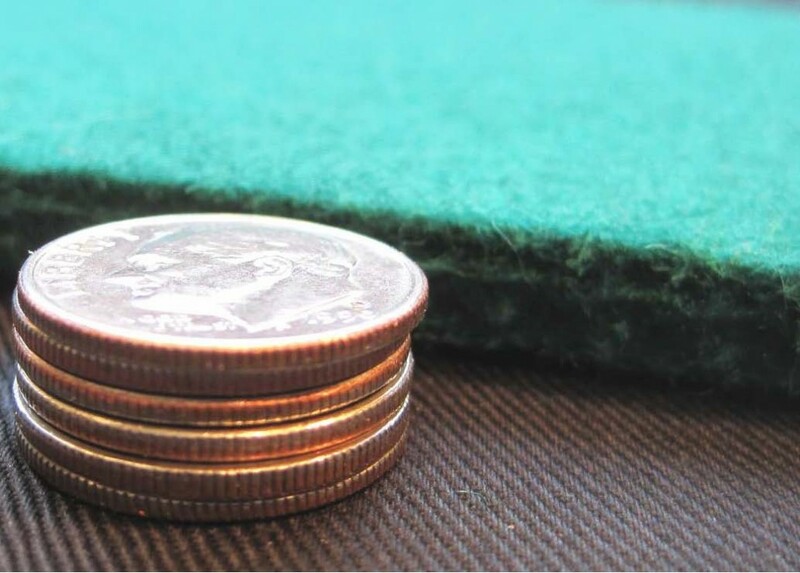 The thickness of heavy backrail cloth equals that of six dimes. 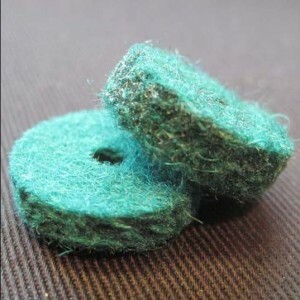 Is the felt used for this job out of the ordinary at all? Very much so. As illustrated in the photo above, the felt used for backrail cloth (as well as balance rail and front rail punchings) is a very thick, dense felt that is designed to stand up to decades of constant use. Keybed felts come in a range of thicknesses, so that the original size of the felt installed at the factory may be duplicated. Paper and card punchings as thin as .002″ are used under the felts for final adjustments necessary for level keys and even key dip. Thinnest and thickest front rail punchings. Is this work best done in the home or the shop? It depends on whether other related work is to be done as well. If keytop recovering, key rebushing or other timeconsuming jobs are going to be done at the same time, transporting the necessary parts to the shop would make sense. If only the keybed felts are going to be replaced and necessary adjustments to the regulation of the piano made, it might be possible to schedule the job to be done in the home. 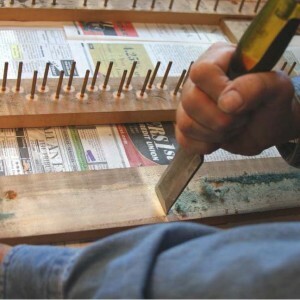 Paper and cardboard punchings which are used to level the keys and set the amount of key dip have typically deteriorated as well and ordinarily need to be discarded and replaced. Are there other related repairs which might be recommended at this time? Yes. At the minimum keys will need to be releveled and the key dip reset. Better yet, a full job of regulating the piano would help bring the performance of the piano back into proper condition. Also a thorough keybed cleaning is usually recommended at this time. Related areas of repair should also be considered. The condition of the front rail and balance rail key pins should be carefully looked at. If corrosion is seen, they should be polished or replaced. The keys themselves should be examined for excessive wear to the key bushings. Keytops may need to be replaced as well. An overall job encompassing all of these factors can do wonders for an older piano. New set of keybed felts in place.